The 870v2 features a reduced heel height of 8mm to promote a more natural foot strike with a soft and forgiving upper offering a snug, but not uncomfortable fit.The use of Revlite midsole cushioning reduces the weight by ½ - ¾ oz without sacrificing cushion. 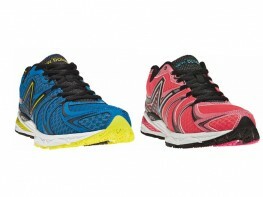 Light weight and great fitting, the New Balance 870 v2 makes for a smooth stability trainer with a hint of speed. Less Weight. Glove Like Fit. Ultra lightweight and responsive, the Nike Lunarglide+4 is 18% lighter than the Nike Lunarglide+3 at 10oz and helps to maximize performance thanks to soft, springy Lunarlon cushioning and dynamic flywire. An inner sleeve wraps around the entire foot for a plush, comfortable fit and easy on and off. The latest LunarGlide features Dynamic Support in the midsole for stability without the added weight or stiffness of a traditional medial post. A soft and springy feel with Ultra-light Flywire threads cradling the foot for an adaptive, glove-like fit makes for a smoooooooth ride in this stability trainer.